CREATE understands that supporting children and young people with a care experience to reach their full potential is easier said than done. Our clubCREATE members and Young Consultants quite often tell us they wish those who support them had more support themselves; sometimes they might need a less bureaucratic system, sometimes more financial support and sometimes it’s about having the resources to develop their understanding of what being in care can be like. 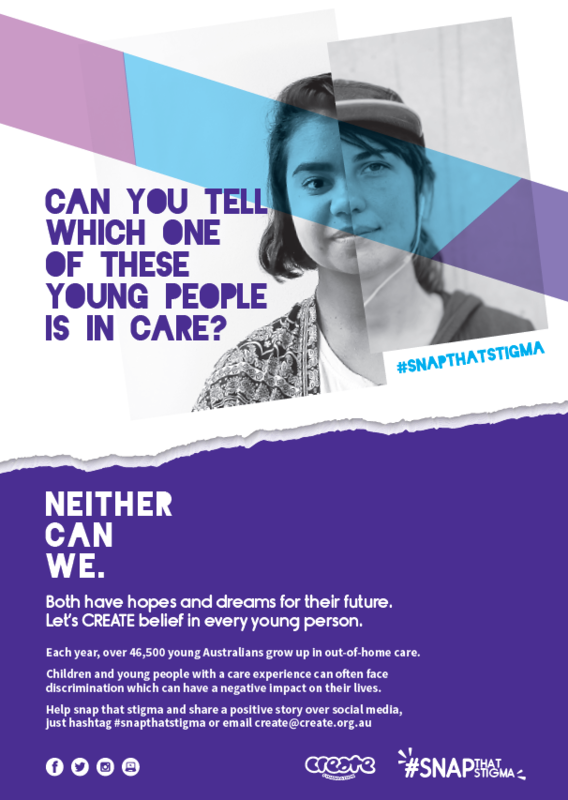 Snap that Stigma is CREATE’s campaign to address the harmful impact of negative stereotypes about children and young people in foster, kinship and residential care. Particularly relevant for professionals and other community members who might come into contact with children and young people in care, our Snap that Stigma resources include two moving videos where CREATE Young Consultants confront the stigma of foster care head on and prove the stereotype wrong. 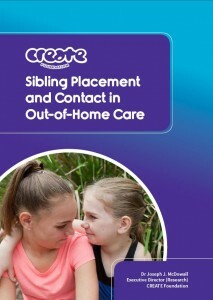 CREATE’s research shows that many children and young people do not live with all of their siblings in out-of-home care, and contact with the siblings who do not live with them is not always regular or easily accessible. This page features a short video following four CREATE Young Consultant’s journeys to keep contact with their siblings, as well as a range of resources for caseworkers and carers to help ensure connection with siblings is maintained wherever possible. For over 15 years CREATE has campaigned passionately to make sure that young people with a care experience can grow into adulthood with the right amount of support and guidance. 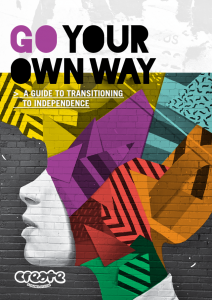 On this page you find a bunch of resources that can be used by both young people and those supporting them; there’s our Go Your Own Way resource, a fantastic tool designed by CREATE Young Consultants to help young people help get the basics of “adulting” sorted. There’s also information about our phone app, ‘Sortli’ which is perfect tool for young people to explore some of the questions they have about adulthood on their own OR as a way for workers and young people to explore options and information together. Since CREATE started our young advocates have stressed the importance of children and young people being informed about, and able to participate in the important decisions that shape their lives- but how do the adults help make this actually happen? On our participation page we cover the Whys and Hows of supporting children and young people to have a say, be heard and participate. So you are really trying to give a child or young person the opportunity to have their say and they are just not interested? 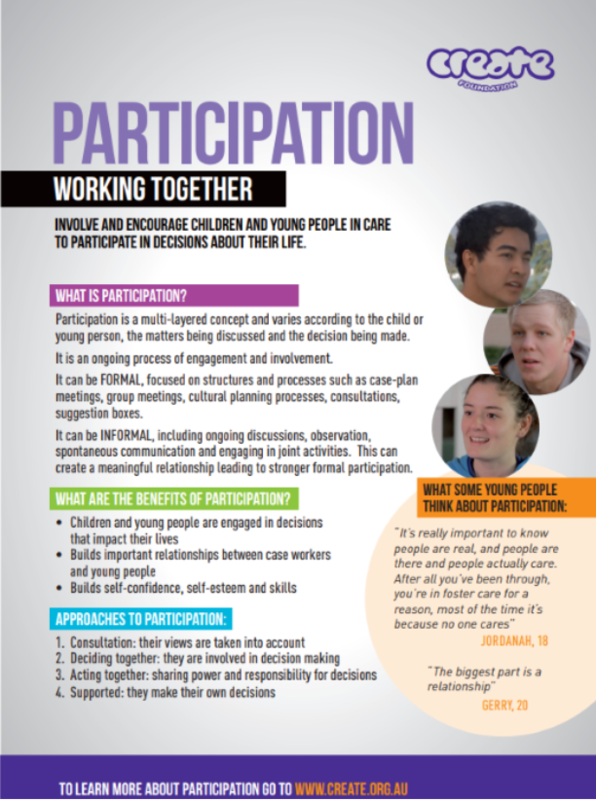 Try this great video resource featuring young people with a care experience encouraging their peers to participate in important processes like case planning meetings. CREATE’s wonderful team in Victoria has been leading the way over the past few years in championing the rights of children and young people who identify as LGBTQI to grow up in care with all the love and support they need. 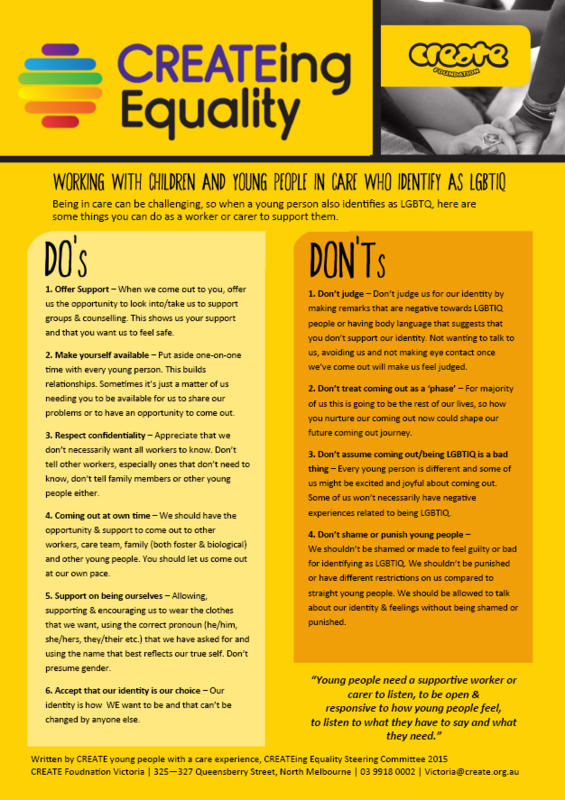 This page contains a video and printable handout produced by CREATE Young Consultants full of useful advice for carers and workers about how they can best provide meaningful support. CREATE wants to make sure all Aboriginal and/or Torres Strait Islander children and young people in care grow up connected to culture and with the same opportunities as other young Australians. Visit this page to meet some of the Aboriginal and Torres Strait Islander young people who are part of the CREATE community and check out some of the important work they are doing, including the launch of a Declaration for Aboriginal and/or Torres Strait Islander Young People in Care in Queensland. Visit this page to see what fantastic state specific CREATE’s teams around the country have been up – includes information and links to the Charter of Rights for children in care in the different states and territories. 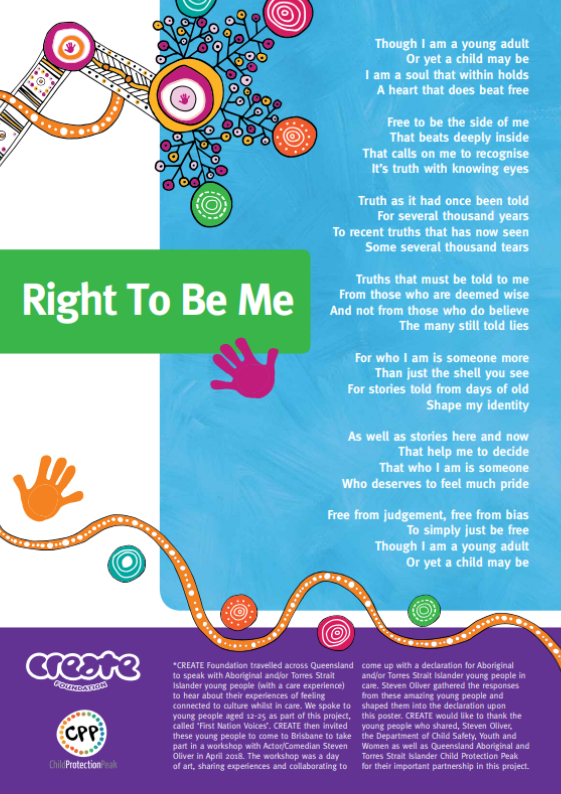 Also on this page you can check out some amazing work CREATE in Western Australia have done on a guide for young people who want to access their case file after turning 18. So check out these resources, get inspired, learn something new and be the change you want to see in the world!